BROOKEVILLE, Md.—From a distance, the neat rows of white markers protruding from the undulating acreage resemble a diminutive Arlington National Cemetery. Up close, however, it’s clear that these aren’t graves. Instead, each “monument” signifies a potential birth. 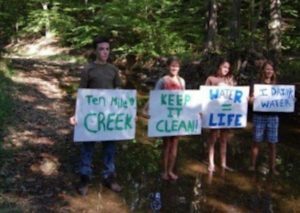 For this is a nursery carefully tended by devotees intent on restoring the American chestnut tree to some of its former glory in eastern forests. On the last Saturday in March, close to five dozen volunteers equipped with gloves, trowels and buckets spent several hours helping organizers with the Maryland chapter of a national nonprofit, The American Chestnut Foundation, put seeds in the ground. Ron Kuipers, a board member of the Maryland branch supervising the event, explained beforehand that this isn’t a free-for-all activity. Doing it right entailed properly placing each chestnut seed about an inch deep in its appropriate “crib” — a four-by-four inch hole dug four inches deep by hand and packed with a recipe of peat, perlite, vermiculite and water mixed at the nursery. Each seed, about the size of an olive, had to be carefully positioned so its radical, or root end, faced downward. The Maryland chapter of The American Chestnut Foundation operates this seed nursery in Brookeville, Md. The chapter conducted a seed planting on Saturday, March 25, 2017. The 1,250 seeds planted that day were collected last fall. 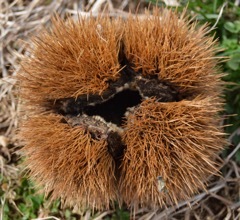 Each prickly chestnut bur contains three seeds. After the harvest, the seeds were packed in peat-filled plastic freezer bags and refrigerated for about 60 days. It’s a process called stratification or cold hardening. Enduring that simulated winter gives them a better chance of germinating. Each crib is encircled with a hand-cut, hard plastic tube designed to keep pests out but let in air, sunlight and rain. The white cylinders are cheek by jowl in each row to encourage the largest crop of sprouts possible. Over the long term, Maryland chapter leaders are combining science and experimentation in the foundation’s quest for a chestnut tree that doesn’t succumb to the blight fungus that decimated the American species beginning at the turn of the 20th century. Part of that discovery involves training volunteers to administer doses of strains of the blight fungus into young, nursery-raised chestnut trees. It’s injected by hand into tree trunks at least one inch in diameter. Trees that sicken with blight cankers or die are culled. Survivors are closely monitored. The nursery—also known as an orchard—where Kuipers was directing the seed planting opened in 2012 on land owned by the Washington Suburban Sanitary Commission about 40 miles northwest of Washington, D.C. The property, fenced to deter hungry deer, is adjacent to the Triadelphi Reservoir on the Patuxent River. It’s one of several of the chapter’s seed orchards in Maryland. Others are breeding orchards. American chestnut trees are monoecious, meaning tree has both the male and female reproductive organs. Still, a single tree can’t pollinate itself; it needs neighbors. 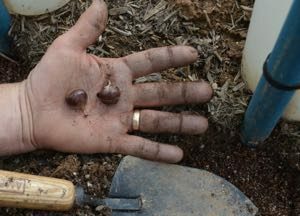 “Fifth-generation” chestnut seeds are planted about an inch deep in a special soil mix and protected from pests with a plastic cylinder. Overall, the Maryland breeding orchards contain about 30 “family” lines. Reaching that number required chapter members to seek out and hand- pollinate some 30 different flowering American chestnuts that were accessible by truck or by ladder. Many of those originals are no longer living. Seed orchards such as the one near Triadelphi Reservoir are planted with the fifth-generation progeny of what started with a hybrid cross of an American chestnut with a blight resistant and non-native Chinese chestnut. Back-crossing has bumped the American genetic composition close to 95 percent. Theoretically, the sixth generation seed should be a blight-resistant one that could be counted on to help restore eastern hardwood forests that were mostly denuded of American chestnuts by the 1950s. But that hasn’t been the case. The science is still evolving on shaping that robust seed. In a nutshell, every step the Maryland chapter executes is much-studied and complex. Members are so meticulous and diligent about their pursuit that nothing is approached in a willy-nilly fashion. As the seeds planted on March 25 grow, Kuipers said the chapter will become more ruthless about weeding out saplings that aren’t super-healthy. That means that as few as two from each plot of 150 could be selected as survivors. Eventually, the chapter expects to harvest nuts by the tens of thousands on that site.